Visually inviting entrances to underground subway systems increase the use of the systems. This entrance to one of the many Vienna subway system stations was designed by celebrated Austro-Hungarian architect and urban planner Otto Wagner (1841–1918). 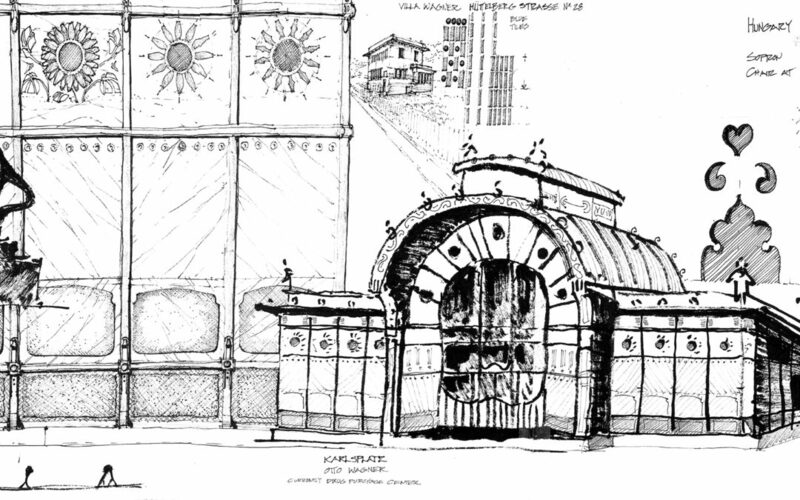 The structure is made of glass and metal with intricate details and sunflower ornamentation. During the day, it glistens in the sun, and at night, it glows like a lantern. The Uber fuel impact is larger than you might think given the distance to pick you up. The average wait time for Uber in our area has been about six to ten minutes. At an average of thirty miles per hour on suburban streets, eight minutes is about four miles. So this adds four miles of fuel to an eighteen-mile trip. This is a 22 percent increase in fuel consumption, and while the riders don’t pay for the gas, the fuel cost is accounted for in the service cost. When I have taken an Uber from one suburban town to another with a distance of only two miles, the same wait time applies. If the driver takes four miles to get to me, this means that the fuel consumption is 200 percent greater than the trip itself for me to get from A to B. At an extreme level, if everyone took a car service instead of going from point A to B through other means, the added connection times would increase our US transportation fuel consumption by 20 percent to 200 percent. The increase in development of autonomous self-driving cars may help reduce the burden of the extra miles incurred with driving services. I was pleased to see in a 2015 interview, on the Late Show with Stephen Colbert, that Uber’s CEO, Travis Kalanick, has plans to increase the number of electric cars, perhaps through a fleet of Tesla cars produced by Elon Musk. Electric cars still create life cycle source emissions given the generation of electricity in coal-fired power plants. However, the emissions are significantly lower. According to the US Department of Energy, for a hundred-mile trip, a conventional combustion engine car emits ninety-nine pounds of CO2 and costs $9.96, while electric cars only emit fifty-four pounds of CO2 and cost $3.56. [i] This emissions savings of almost 50 percent is meaningful as is the cost reduction, given the growing number of Uber miles and the ongoing volume of transportation miles across America each year. The cost ranking for the round-trips addressed here are almost an exact reflection of the energy efficiency rankings. The train is the least expensive and the Uber single-couple ride is the most expensive. The advantage of ride sharing is reduced parking costs as well as the reduced fuel cost per passenger relative to the single-couple car rides. We have strength in numbers! Author and illustrator: Charlie Szoradi is an architect, inventor, and the CEO of Independence LED Lighting. He writes about many other topics related to transportation and car services like Uber through his extensive travels around the world. If you have found this posting online, it is an excerpt from Mr. Szoradi’s book Learn from Looking that served as the inspiring seed content for this drawing share resource. For additional drawings and insights on transportation, we hope that you enjoy exploring LearnfromLooking.com. You can search via general terms such as sustainability as well as narrower terms such as public transportation and individualized transportation such as Uber. Austria 1: Detail (c), US Department of Energy—Alternative Fuels Data Center: http://www.afdc.energy.gov/vehicles/electric_emissions.php.